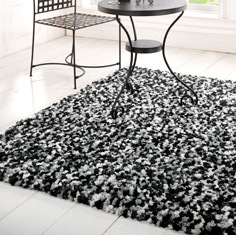 Soft Mix shaggy rugs - Handmade from polyester and space dyed for a livelier appearance. The soft and cosy pile gives a wonderful feel under foot. This collection is ideal for adding a warm ambiance to an interior, the pile is very inviting and ideal for winter. Available in 6 colours and 3 sizes. Custom made sizes are available to order.